The rise of shared spectrum and protocols like LAA and MulteFire, will lead to a whole raft of new threats to existing cellular operators. The rising popularity of enterprise small cells will mean that by 2022, enterprise units will account for almost half of all small cell deployments, up from 7% in 2014. 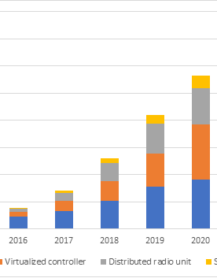 The installed base will reach 14.8m in 2022, up from 185,000 in 2014 and owners who invest in enterprise small cells will operate a financial grip on the market in the 2020 time frame. There will be a rise in the importance of unlicensed spectrum driving enterprise and vertical small cells to scale with LTE-LAA roll-outs starting in 2018 and the more disruptive MulteFire running about 9-12 months behind. By 2020 these two will account for 25% of all new deployments. Enterprise small cells, particularly those operating in unlicensed spectrum, could be the undoing of Mobile Network Operators, relegating them to “utility” commoditization, and falling revenues, as both license free spectrum and shared spectrum ideas, are taken up aggressively by newcomers. In “Small Cells and Shared Spectrum: Powerful Weapons Against the MNO Model” there are clues that MNOs who have been so far averse to sharing resources, will become urgently driven by densification initiatives. By 2018 the desire to keep costs down will show in MNO’s willingness to finally work with third parties. These third parties, as a result, will be able to build out their own networks. Small cells were conceived as a way to improve the mobile operator business model, but they may now become weapons for challengers to MNOs, particularly broadband players with established backhaul such as Cable operators. Established MNOs have so far been slow to embrace network sharing. Now they may lose the initiative in favour of neutral hosts, cable operators and private network operators. These can harness a combination of enterprise small cells and unlicensed spectrum, to build their own localized networks which will target much of the highest value usage. Arenas, transport hubs, enterprises and municipalities will be the natural targets for densification, but a new kind of MVNO is likely to emerge, with their own small cell assets in one particular geography. Vendors large and small are developing ‘network in a box’ offerings which can be deployed quickly for temporary requirements, or can support a self-contained network, with full mobile core and RAN functionality, on a localized piece of equipment. This might be a small cell or a local server. Quortus and Core Network Dynamics, two specialists in this field, have both demonstrated virtual packet cores on cheap processing boxes. Larger players like Nokia are developing platforms to support private and enterprise service providers, and the large vendors increasingly look poised to cut out the MNO where they can monetize the industrial users directly. Regionally, there will be different patterns of deployment, though the Asia-Pacific region will be the powerhouse throughout the period accounting for 55% of unit deployments in 2022, maintaining a similar share throughout the period. The highest CAGR rates will be seen in Africa, at just over 100%, and CALA, at 86%, but starting from a very low base. This is the moment when the MNO risks being forced back to being simply a utility, as electricity generation or railway networks were before them. – Figure 9. Comparison between 5G and 802.11ax requirements indicating close alignment of roadmaps. • New challengers will undermine the traditional MNO model, which relies on control of expensive licensed spectrum, and will prompt the established operators to hit back with their own densification initiatives.